Without the help from these amazing contributors, building this awesome-repo would never has been possible. Thank You very much guys !! Thanks to Gitbook.This awesome list can now be downloaded and read in the form of a book.Check it out --> https://www.gitbook.com/book/ramitsurana/awesome-kubernetes/ .Keep Learning Keep Sharing !! The first unified container-management system developed at Google was the system we internally call Borg. It was built to manage both long-running services and batch jobs, which had previously been handled by two separate systems: Babysitter and the Global Work Queue. The latter’s architecture strongly influenced Borg, but was focused on batch jobs; both predated Linux control groups. Kubernetes celebrates its birthday every year on 21st July. Kubernetes 1.0 was released on July 21 2015, after being first announced to the public at Dockercon in June 2014. 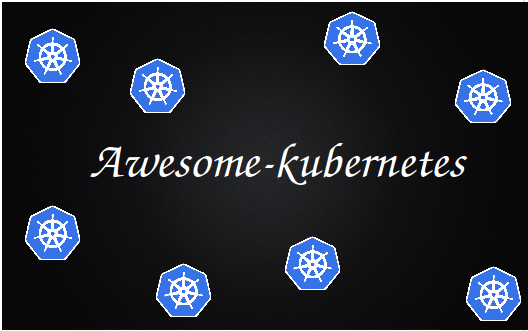 The awesome-kubernetes will now soon be available in the form of different releases and package bundles, It means that you can download the awesome kubernetes release up to a certain period of time, The release for awesome kubernetes 2015 bundle is released. Checkout the releases column for more info. Are you Ready to Manage your Infrastructure like Google? matchbox - CoreOS - Network boot and provision Container Linux clusters (e.g. etcd3, Kubernetes, more). Kubernetes Security Guide - RBAC, TLS, Security policy, Network policy, etc. teresa - Simple PAAS that runs on top of Kubernetes. Kubefwd - Bulk port forwarding Kubernetes services for local development. Helm - For further information, please check out - Awesome Helm. Cloudsmith - A fully managed package management SaaS, with first-class support for public and private Kubernetes registries (Docker + Helm Charts, plus many others). The Elastic Stack - An open-source solution for monitoring and visualising K8s metrics, logs, application traces and more. eventrouter - simple introspective kubernetes service that forwards events to a specified sink. kail - Kubernetes Log Viewer. Streams logs from all containers of all matching pods. New Relic - Kubernetes monitoring and visualization service. NexClipper - An open source software for monitoring Kubernetes and containers. Apollo - Open Source application providing teams with self service UI for creating and deploying their services to Kubernetes. Argo CD - Declarative continuous deployment for Kubernetes. Buildkite - Lean CI/CD cloud hosted control plane with agents on your infrastructure. k8s-deploy-helper - Framework to easily deploy Kubernetes applications via GitLab. Shipper - Kubernetes native multi-cluster canary or blue-green rollouts using Helm. Virtual Kubelet - Allows nodes to be backed by other services and providers. PostgreSQL - manage PostgreSQL clusters using StatefulSets and Patroni. A list of linux containers supported by kubernetes. NSX-T - CNI plugin supporting load balancing and distributed firewalls. Kamus - A GitOps, zero-trust solution for secrets encryption/decryption solution. click - A CLI focused REPL for quickly interacting with Kubernetes objects. kube-prompt - Interactive kubernetes client built using go-prompt. kube-ps1 - Kubernetes prompt helper for bash and zsh. kubensx - Simpler Cluster/User/Namespace switching for Kubernetes (featuring interactive mode and wildcard/fuzzy matching). kubectl-plugins - A collection of kubectl plugins handling everything from easy context switches to connecting to a container as any user (root included) via exec. Slightly tailored towards GKE users. Skaffold - Command line tool that facilitates continuous development for Kubernetes applications. Gitkube - Build and deploy docker images on Kubernetes using git push. Pulumi - Provides a SDK for k8s deployments targeting on-premises clusters and major cloud vendors&apos; managed services. Calico Network Policy (from Tigera) - Widely adopted open source implementation unifying Kubernetes Network Policy and Istio Application Policy. Guard - Authenticaton webhook server with support for Github, Gitlab, Google, Azure and LDAP (AD) as identity providers. kiam - Allows cluster users to associate AWS IAM roles to Pods. kube-bench - The Kubernetes Bench for Security is a Go application that checks whether Kubernetes is deployed according to security best practices. kube-hunter - Hunt for security weaknesses in Kubernetes clusters. MetalLB - load-balancer implementation for bare metal Kubernetes clusters, using standard routing protocols. mxnet-operator - Tools for ML/MXNet on Kubernetes. kubeflow - Machine Learning Toolkit for Kubernetes. MLT - Machine Learning Container Templates: easy to use container and kubernetes object templates. kube-libsonnet - Generic library of Kubernetes objects for Jsonnet/Kubecfg with object to array mapping for painless overrides. Velero - Utility for managing backup and restore of Kubernetes clusters. Formerly Heptio Ark. kube-backup - Sync kubernetes state to git. Some of the awesome findings and experiments on using Kubernetes with Raspberry Pi. A slide is a single page of a presentation created with software such as PowerPoint or OpenOffice Impress. Twitter is quick, it’s easy to communicate on, and is a very valuable social channel for a brand or business if you use it to its full potential, By following these news aggregators, rolling news channels, and companies, you can get the inside scoop of a story long before it hits the mainstream news outlets. Check out the Contributing Guidelines. awesome-kubernetes by Ramit Surana is licensed under a Creative Commons Attribution-NonCommercial 4.0 International License.